Patients of our practice will be aware how passionately our whole team feels about the early detection of mouth cancer; a killer disease that can strike anyone. The good news is that early detection saves not only lives but also the quality of life. Early detection vastly increases the chance of a cure and makes treatment simpler; avoiding the life-changing consequences that can result when the disease is discovered late. That’s why all our patients receive a free examination for early signs of mouth cancer at every check-up appointment. As an Ambassador for the national charity The Mouth Cancer Foundation Philip Lewis has been asked to lecture at the Dentistry Show in Birmingham in April. This prestigious event attracts thousands of dentists and dental team members. The last time Philip lectured there the event was so oversubscribed that some 300 people had to be turned away. This time there’s a bigger hall so hopefully everyone who wants to attend can learn from Philip’s experience about how to make mouth cancer screening an integral part of their daily practice. There’ll be a full report in the next Newsletter! Whether we’re excited or just downright bored the General Election on May 7th will have far-reaching consequences for us all. Philip Lewis serves as a media spokesman and parliamentary co-ordinator for the British Dental Association and so will be taking a keen interest in local candidates’ plans and views on improving healthcare in general and dentistry in particular on the island over the next five years. Watch this space! Gum disease is still the major cause of tooth loss among adults in the UK. More teeth are extracted because of gum disease than any other cause. As well as the services provided by our Hygienist and Therapist we are now able to refer patients with advanced gum disease to a specialist on the Island without the need for mainland travel which was necessary before now. Please ask Joy for more details if you think this service would be of benefit to you. Well perhaps not quite yet but we’re getting there! 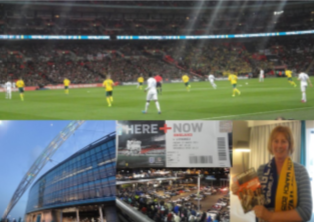 At the end of March, Philip and Joy decided to do something completely non-dental and attended the European fixture of England versus Lithuania in Wembley. It’s good to do something different occasionally and it was certainly motivational watching 22 players all trying their very best while working together as teams. Our team members may not be athletes but we hope we’re as committed to excellence and pleasing our patients as Welbeck and Rooney are at pleasing their public! I’m always amazed at the amount of waste when preparing vegetables. Cabbage, sprouts leeks, onions and cauliflower for example tend to have outer leaves that look dull and tired so we remove them. I don’t mean the nasty brown bits: they go straight to the compost; just the parts that are perfectly alright but less than attractive. 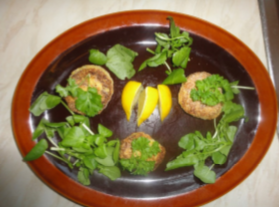 One good way of using up these leftovers is in vegetable patties. Put all the discarded leaves in a saucepan or pressure cooker. Add a carrot for sweetness and a stick of celery. (This can also be an outer stalk). Boil until completely soft then drain thoroughly. Boil a couple of potatoes. Mash them with the cooked vegetables and season well with salt and black pepper. Other spices or herbs of your choice can also be added if required along with a spoonful of flour or a beaten egg to help bind the mixture which should be stiff enough to easily hold together. If you’re not vegetarian you could also add some chopped anchovies or chopped Parma ham. Form into flat patties about the size of a beef burger. Coat in polenta flour and fry for about 3 minutes each side until golden. Serve as a side dish or as a light meal with a tomato sauce or even maple syrup if meat and fish free. You’ll notice there are no quantities given for this recipe as it obviously depends on the amount of leftovers you have. The water in which the vegetable were cooked, (including the water you boiled the potatoes in) can then be used as a vegetable stock for gravy or as the base for a soup. If you like the way we do things at Avenue Road Dental Practice please tell your friends! We are always delighted to accept new patients on recommendation. Ask Joy for some referral cards at reception or ask your friends or relatives to call us on 01983 759567. Avenue Road Dental Practice Freshwater PO40 9UT. This entry was posted on April 15, 2015. Bookmark the permalink.